The Blue Lagoon was created accidentally by the condense discharge from the geothermal power plant in Svartsengi. The water was expected to disappear into the permeable lava field, but sedimentation gradually made the coarse lava field watertight, and the lagoon continued expanding. It has become the most frequented tourist attraction of the country. Soon after people started bathing in the lagoon, the healing qualities of the brine were discovered by those, who suffer from skin diseases, such as psoriasis. Since then an increasing number of patients from all over the world has enjoyed the relief of the chemical composition of the water. Native patients, who need treatments at the Blue Lagoon are covered by their social security, which means that the authorities have recognize the necessity for such treatments. A hotel and restaurants are located near and on the Blue Lagoon. There are extensive hot spring areas on the Reykjanes peninsula, and it was natural, therefore that local people thought of heating their houses by geothermal sources. In 1961 the first plans for geothermal regional heating were completed for Keflavik, Njardvik and Keflavik Airport. These plans were formulated on behalf of the geothermal commission of Keflavik and Njardvik. Further plans were made in 1963 for the Iceland Defence Force at Keflavik Airport and in this case two geothermal areas were considered: The Reykjanes peninsula and the Stapafell area, assuming that enough hot water could be obtained by drilling. In 1969 the town council of Grindavik decided to explore the area near Svartsengi for the possibility of geothermal heat, which could be harnessed for domestic heating in Grindavik. In 1971 and 1972 two holes were sunk some three miles north of the town Grindavik, near Svartsengi. These holes were 790 and 1300 feet deep. The result of this drilling was very promising and proved among other things, that this was a ‘high temperature area’ and the hot fluid was brine. In January 1973 the Icelandic Energy Authority completed preliminary plans for a regional heating system from Svartsengi. The results of this planning were promising and seemed to justify further exploration of that region. As a result, the Energy Authority planned a complete exploration of the geothermal region at Svartsengi and two more holes were sunk, 5000 and 5600 feet deep. In addition, electric resistivity measurements were made there in an effort to determine the total size of the ‘hot’ region. They seemed to indicate that the extent of the geothermal system at a depth of several hundred feet was about 400 ha. The outer perimeter could not be defined exactly because the salinity of the ground water at some depth around the ‘hot’ region still decreases the low resistivity that is coursed by the heat. As it had been proven that technically it was both possible and feasible to build a geothermal heating plant for the whole Sudurnes region using the geothermal energy at Svartsengi, the various communities in the area joined together to cooperate in this venture. The region comprised seven separate towns or municipalities, each one having it’s own financial and political council. In addition Keflavik Airport is situated in the middle of the area. This is an international airport used for transit landing by various international airlines on their inter-continental flights. Keflavik Airport was also a NATO base, where the American Defence Force had it’s main operation in Iceland in accordance with a special treaty with the Icelandic government. With this in mind, a law was passed in Althing (Parliament) in December 1974 to facilitate this co-operative undertaking. The law states that Sudurnes Regional Heating shall be owned by the seven independent municipalities and the State of Iceland. The proportions of ownership were to be as follows: The regional municipalities 60% and the State of Iceland 40%. It was considered essential that the State was a part owner to ensure the rights of Keflavik Airport to the regional heating. A further definition of ownership was decided on proportionally, based on the regional census, as of the first day of December 1974, which resulted in the following: Keflavik 31,04%, Grindavik 8,11 %, Njardvik 8,70%, Sandgerdi 5,55%, Gerdahreppur 3,76%, Vatnsleysustrond 2,13% and Hafnir 0,71%. Total of 60%. The drilling at Svartsengi had revealed that there was more energy available there than even the most optimistic people had hoped for. This naturally increased the value of the land. However, an agreement was made between the landowners and the Regional Heating stating the needs of the Regional Heating Corporation for land and energy, and in addition an agreement was reached on the terms of payment, while the total amount of payment was to be decided by an arbitration committee consisting of three men to be agreed upon by both parties. The decision of the arbitration committee was based on the value of 99 ha of land, hits being the area that was considered to be essential for the waste of water from the power station. In addition to all the thermal energy within a 10 Ohm resistivity line, consisting of an area roughly estimated 2100 ha. The results of research indicate that in the near future, the thermal energy outside the 5 Ohm resistivity line will not be needed. The size of the area inside the 5 Ohm line is approximately 400 ha, and it is estimated that this could yield sufficient energy supply for a 150 MW geothermal power station. The decision on the value of the land and geothermal power was Ikr. 87,700,000.- (approx. $ 1,4 million) in the year 1976. 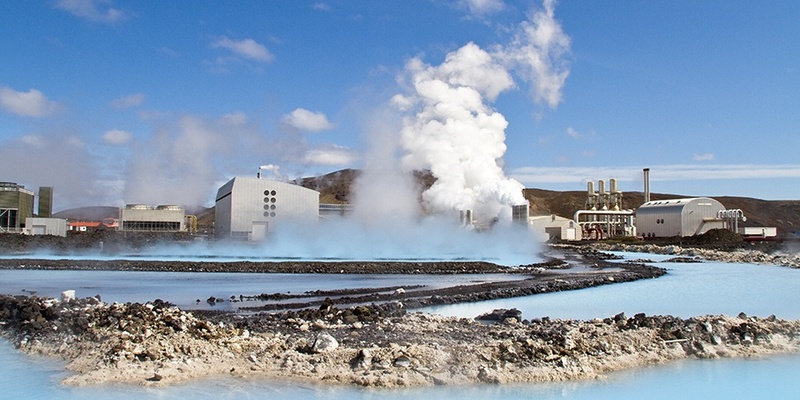 Due to the high temperature and salinity of the geothermal fluid, a special heat exchange process was developed to make use of this energy source for district heating. Fresh cold water is pumped from the ground in the vicinity of the Power Plant and heated to some convenient temperature levels (95-125°C) and then pumped to the small towns and villages for the direct use in the individual heating systems and as hot tap water. Most of the system is of the ‘once through’ type, which means that the water is wasted through the sewerage system after the heat has been extracted (at about 40°C). Peak load requirements of the market in the nearest future amounts to some 110 MW or 350 kg/s of hot water, which if oil fired, would require some 15 metric tones (100 barrels) of fuel oil per hour. The distribution system of Sudurnes Regional Heating extends to seven municipalities besides the Keflavik Airport. The accumulated length of all pipelines is about 300 km. The hot water is piped only one way to the municipalities, but couple with tour and retour on the airport. The main pipelines from the power station at Svartsengi are laid out above ground and insulated with rock wool, protected with aluminium foil, but all other pipes are underground within the boundaries of the more densely populated areas and are therefore not obstructive to traffic or environmental interests. The water is distributed from the power station at two temperature values. Water that goes to Grindavik is 83°C, and there it is assumed that the water reaches the consumer at 80°C. The hot water that is sent to the municipalities on the north side of the peninsula goes out at 105-120°C to the pumping station in Njardvik, where it is mixed with retour water from the airport and then sent out at 80°C to the consumers in the area. Generally it is assumed that the consumer does not throw his water away warmer than 40°C when it goes into the sewerage system and finally into the ocean. Thus it is evident, that water pumped from the Svartsengi area is considerable, or could be close to 1200 tones/hour, but it is assumed that the water in the annual precipitation on six miles square is sufficient for the total demand. The high pressure steam is used to generate electricity by means of steam turbines. Today three such are in operation and produce a power of 8 MW. In this way the power station is able to produce a considerable output of electrical energy. The annual operating time of the turbines can easily be 7000-8000 hours. The total production was close to 62 GWh during the year 1985. When all practical extraction of the heat has occurred by heat exchange, the brine is let out into the surrounding lava field at 70°C where it accumulates in the ‘Blue Lagoon’. In the year 1981 some psoriasis patients made experiments with bathing in the lagoon and the baths seemed to give at least temporary cure, which is in accordance with a known fact from other places, that sulphur rich water has curing effects on psoriasis, rheumatism, sciatica, eczema etc. The curing effect on psoriasis already obtained, has led to the road to further investigations and experiments with bating of patients in the lagoon. The results of these experiments were consistent with the first results. There was no doubt, and a clinic was built at Svartsengi after the opeing of the new facilities in 1999. During the years the number of visitors to the lagoon has steadily increased. The original Blue Lagoon was created unintentionally by the condense outlet water from the power station in Svartsengi. The water was supposed to disappear into the permeable lava field. It became the most frequented tourist attraction of the country. One of the series of „Good Morning America” was shot there and broadcasted all over the world. Soon after people started bathing in the lagoon the healing properties of the brine were discovered by those, who suffer from skin diseases, such as psoriasis. Since then an increasing number of patients from all over the world has enjoyed the relief the chemical composition of the water. Native patients, who need treatments at the Blue Lagoon, are covered by their social insurance, which means that the authorities have acknowledged the results of the chemical analysis of the water carried out in the nineties. In 1999 new facilities were opened for visitors and a man made lagoon with constant renewal of the warm water was created. The new facilities offer a café and a restaurant, and Hotel Northern Lights with a restaurant is located near the new Blue Lagoon. The distance from the capital is about 48 km. The geological exhibition, Gjain in Eldborg, was moved to The Salt Fish Museum in town Grindavik in 2011.